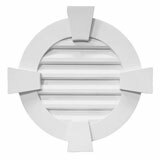 Round louvers available as architecturally decorative louvers or with screening to allow for functionality and ventilation. Louver Key To Key Diameter: 24 in. 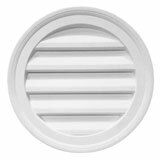 Louver Outer Ring Diameter: 20-13/16 in. Louver Overall Width: 28 in. Louver Overall Width: 30 in. Louver Key To Key Diameter: 32 in. 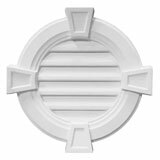 Louver Outer Ring Diameter: 30 in.